Roast Chicken with Lemon, Thyme for Cooking simple main course. Roll the lemons on the counter with your hand a few times, pressing lightly. With a toothpick prick the lemons all over, 20 - 25 times. Put the lemons inside the chicken. Turn the oven to 400F and roast for 20 - 25 more minutes. Skin should be golden brown and puffy. 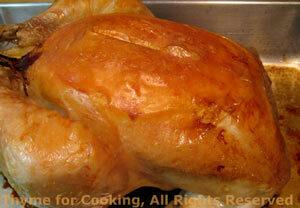 Remove, let rest for 5 - 10 minutes, then carve and serve with pan juices. Pour 1/2 cup chicken stock into the roasting pan. Scrape up any brown bits and pour it all into a small saucepan. Dissolve 1 tbs cornstarch in 1/2 cup chicken stock. Slowly pour into saucepan, stirring until clear and thickened to your liking. Serve with chicken.